Financial analysts are accountable for reviewing investment proposals and returns on the same. Hence, they investigate financial and operational consequences before recommending any adjustments that will lead to better results. While checking on their internal and financial concerns against those of the industry, they carry out cost-benefit analyses. They must review budget proposals before accepting and recommending them to the top management. 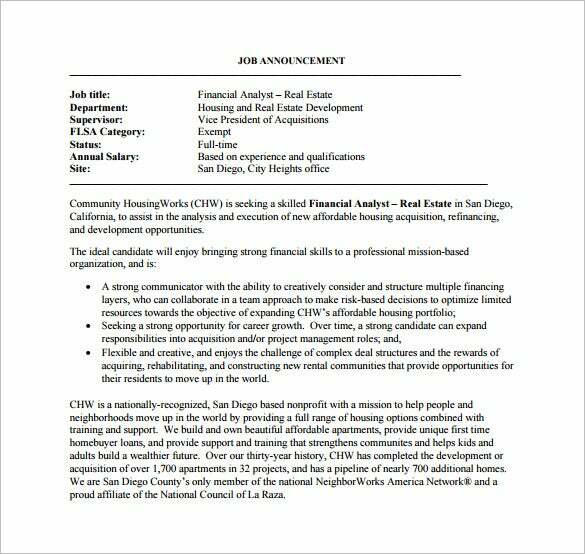 You may like Data Analyst Job Description Templates. They use multiple scenes to forecast the future of their business. With this, they can not only review and recommend varied forms of investments judging from their risk and return relationship but they can also prepare and update industrial and competitors analyses. You may also like Job Description Templates. 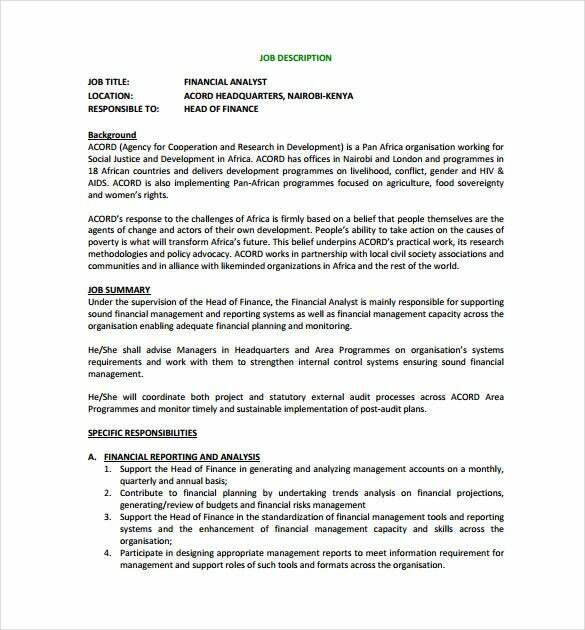 acordinternational.org | The chartered financial analyst example job description template can be used as a guide for detailing the responsibilities and the requirements of a chartered financial analyst. It can help in creating attractive job description for the probable candidates. rljlodgingtrust.com | The associate financial analyst job description template is the best resource for employers seeking professional and experienced candidates for the post of an associate financial analyst. grupoecos.com | Use the investment and project finance analyst sample job description template for detailing the experiences, the knowledge and the activities that need to be carried out by investment and project finance analysts. 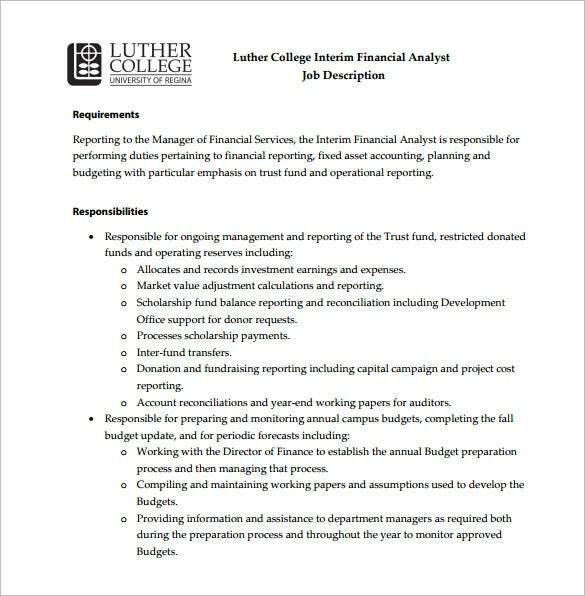 luthercollege.edu |The interim financial analyst example job description template in PDF format is of good use in providing the complete details of the tasks that the employers want their interim financial analysts to carry out. 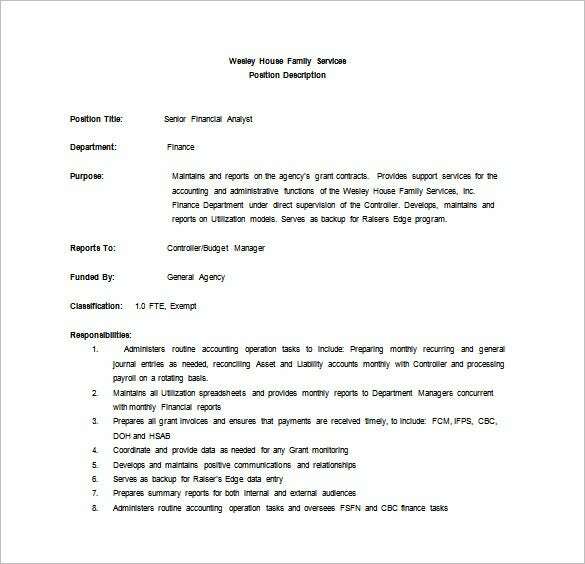 > Why Do You Need Financial Analyst Job Description Templates? 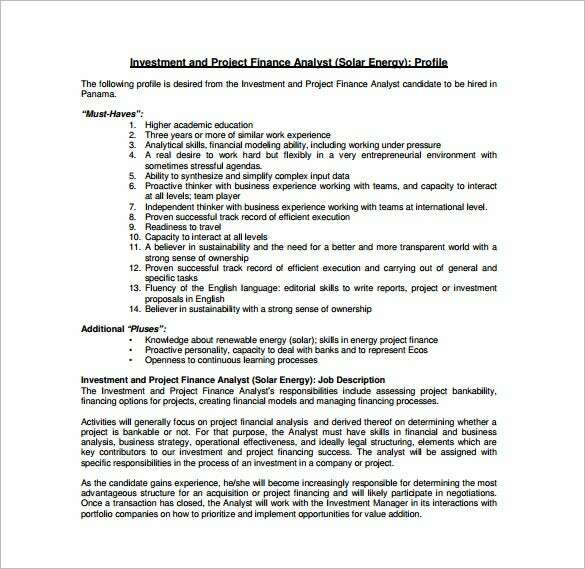 Financial analyst job description templates are needed for clarifying the roles of a financial analyst. The templates can be used for detailing the responsibilities and the requirements of financial analysts including the determination of the operations cost. 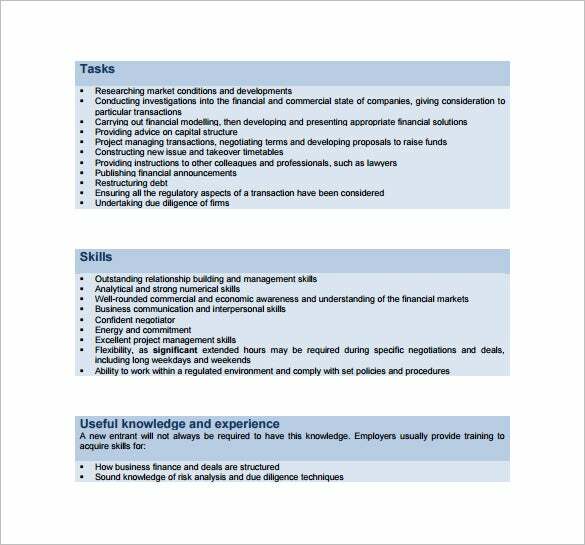 Financial analyst job description templates go a long way in envisaging the importance of the role of a financial analyst within an organization. There are different varieties of these templates widely available online and they can be chosen as per requirements. These templates are available with varied formats and styles. 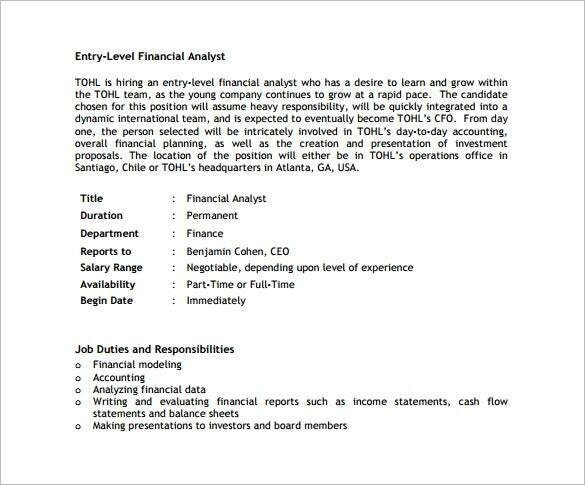 > When Do You Need Financial Analyst Job Description Templates? The financial analyst job description templates are needed by employers who are in the look out of the best and the most qualified candidates to work at the position of a financial analyst. The employers make use of the best financial analyst templates available online for chucking out the employees they consider best for their organization. 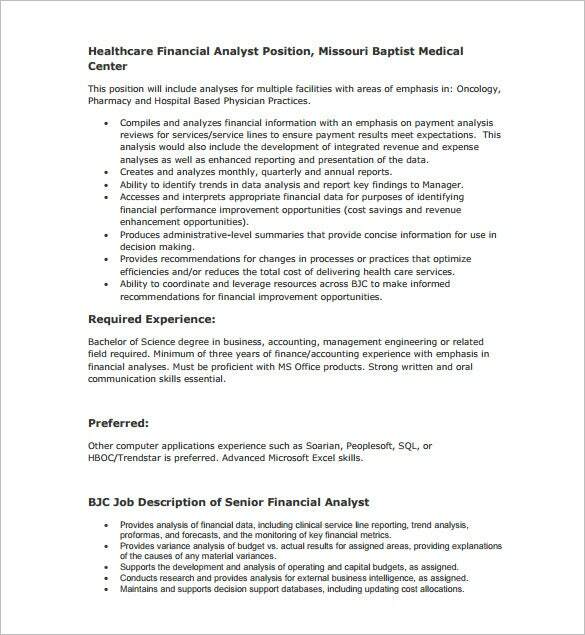 They use these templates for detailing the role, the qualification, the experience and the knowledge that they are looking for in the applicants who are interested in working as financial analysts for their companies. 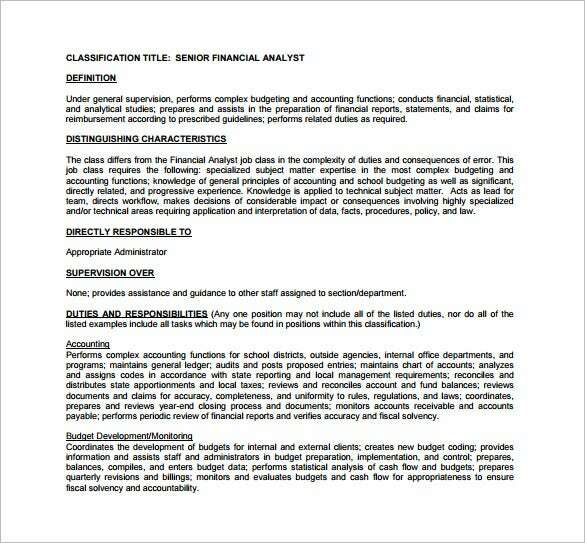 > What Are the Benefits of Financial Analyst Job Description Templates? Also known as investment analysts or securities analysts, financial analysts carry out the job of advising businesses in making investments based on financial information. The financial analysts also deal with world and national finance. There are others who specialize in pension funds. The role and the responsibility of a financial analyst is quite important and it is necessary for the applicants to have a clear idea about the activities and the tasks that they need to carry out when working as financial analysts. This is the reason why it becomes important for the potential employers to use impressive financial analyst job description templates. The use of these templates helps the employers in attracting the right candidates for this job position. 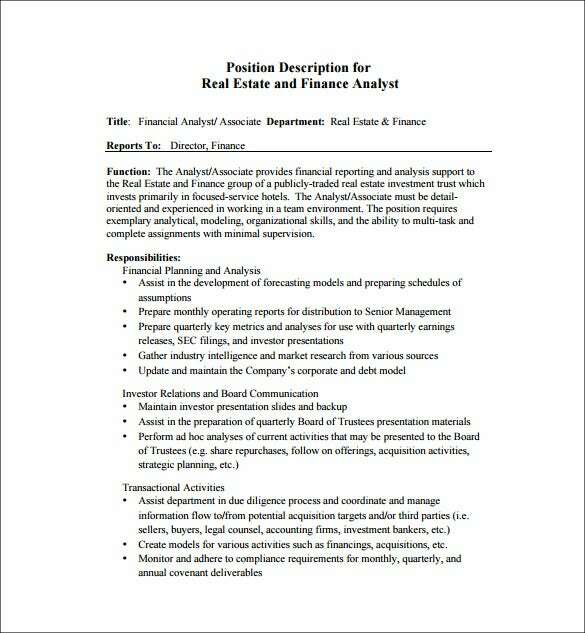 A standard financial analyst job description template helps in detailing the qualifications and the experiences expected from a financial analyst. These templates can easily be downloaded, printed and edited.